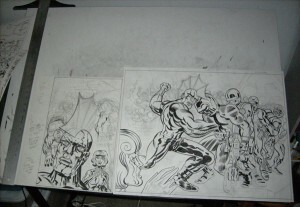 Here’s an in-progess snapshot of a crazy Savage Dragon story I’m working on. 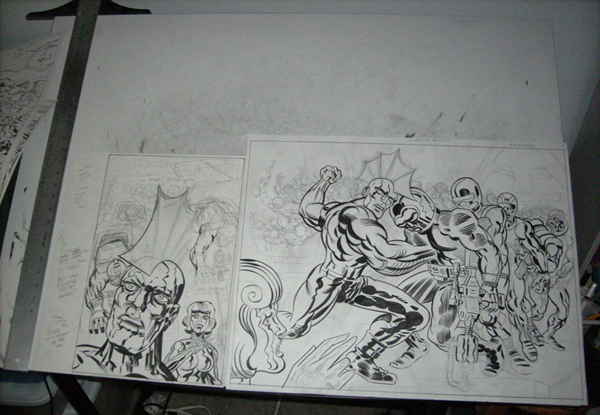 It’s a four-pager, these are page one and the double-page spread. Panel-for-panel, this might by the most narratively compressed story I’ve ever done. YES! Is this going to be a backup story in Savage Dragon? Can’t wait to see the final product! These look awesome. Will Erik allow you to post it here in full when it’s done? I assume so. I’ll definitely ask.